Another chapter in the history of South Lancs Travel was written today as Green Triangle Buses changed ownership for the second time in three years. On Saturday 28th February 2015, at 2359 hours, Rotala plc completed the acquisition of the entire share capital of Green Triangle Buses Ltd. Upon acquisition the current Directors will resign; Simon Dunn, Kim Taylor, Bob Dunn and Antony Goozee will be appointed Directors of the new acquisition. Prior to then, the company was owned partially by D&G and Julian Peddle, late of Status Bus and Coach. The legal entity name will be changed to Diamond Bus (North West Ltd) and over the medium term the intention is to rebrand the business. Their new acquisition will form part of Rotala plc’s North West Division. Consequently it will be supported by the Preston Bus business and Bob Dunn will become the Managing Director. Rotala Plc sees this opportunity as an entry into the Greater Manchester area. With improved resources, the company is better placed to compete against First Greater Manchester and Arriva North West, who have a sizeable market share in the Bolton, Leigh and Atherton areas. Though the acquisition does not represent a material transaction to Rotala, it will be notified to the London Stock Exchange before the market opens on Monday. Green Triangle Buses began as an independent company formed in 1998 by Martin Bott and David Stewart. In 1999, it purchased Bellairs and Dootson, rebranding both Green Triangle and B&D routes as South Lancs Travel. Expansion came through GMPTE tender gains and commercial services. One of them was Atherton Bus Company’s 592 from Bolton to Shakerley, following the owner’s retirement. In 2006, Julian Peddle purchased a 30% state in SLT leading to, five years later, sale of the remainder to D&G Bus. 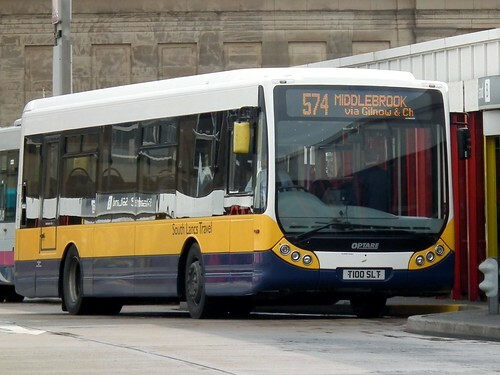 The Crewe based company is a significant player in its locality, with services including the 38 from Macclesfield to Nantwich via Sandbach (Sundays and Bank Holidays). Further expansion came when Strawberry Bus’ operations were acquired by D&G in 2012.